The New Jersey-based non-profit Siemens Foundation created the competition to enhance science and mathematics education in America. It is open to individuals and teams of high school students who develop independent research projects in the physical or biological sciences or mathematics. Competitions in six regions across the United States are being held throughout November. Regional scholarship winners advance to the national competition Dec. 4 through Dec. 8 in New York City for a top individual prize of $100,000. Members of the top winning team will share a $100,000 scholarship. 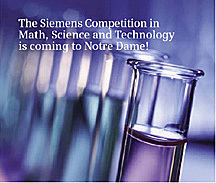 The Siemens Foundation has partnered with six of America’s leading research universities to assist in judging and hosting the regional competitions throughout the fall: the Massachusetts Institute of Technology and Notre Dame (Nov. 7-8), the University of Texas and Carnegie Mellon University (Nov. 14-15), andthe Georgia Institute of Technology and the California Institute of Technology (Nov. 21-22). The public can view student posters at 5:30 p.m. Friday (Nov. 7) in the study lounge of the Jordan Hall of Science. The competition’s keynote address will be delivered by Dava Newman, Notre Dame alumna and professor of aeronautics and astronautics and engineering at the Massachusetts Institute of Technology, at 8 p.m. Saturday (Nov. 8) in the Sargento Auditorium, Jordan Hall of Science. Newman’s talk, which is titled"Human Exploration from Earth to Mars,"is free and open to the public. The Notre Dame individual finalists are: Ashok Cutkosky, David Henry Hickman High School, Columbia, Mo. ; Eric Shyu, Illinois Mathematics and Science Academy, Aurora, Ill.; Philip Streich, home school, Platteville, Wis.; William Sun, Parkway Central High School, Chesterfield, Mo. ; and Richard Wang, University Laboratory High School, Urbana, Ill. The Notre Dame team finalists are: Kelsey Lawhorn and Anthony Yunker, Illinois Mathematics and Science Academy, Aurora, Ill.; Raphael-Joel Lim, Indiana Academy for Science, Math and Humanities, Muncie, Ind., and Mark Zang, William P. Clements High School, Sugar Land, Texas; Karthik Vantakala and Yaseen Jamal, Illinois Mathematics and Science Academy, Aurora, Ill.; David Yang and Yingxue Li, Carmel High School, Carmel, Ind. ; Frank Zhang, Naperville Central High School, Naperville, Ill., and Melissa Yan, Phillips Academy Andover, Andover, Mass. Originally published by William G. Gilroy at news.nd.edu on November 04, 2008.